Hey, I finished another one! 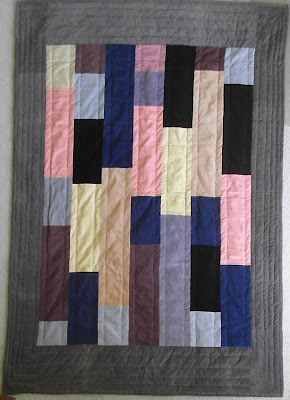 Made of scrap corduroy, this is the twelfth of the "QuiltStorm" project, the quilts I make out of scrap and salvage materials. It is imaginatively named "StormQuilt #12." A few additional details are on the State of the Craft post. I am quite taken by the peach colour which is odd because I really don't care for peach as a colour. I also like the fawn brown you used for the edging. I bet the courderoy has a nice texture and is a good weight for a winter quilt! I really like this one... the pink really brightens up the blues and greys.